There was a time when she nearly walked away. When she felt that being a part of The Neighborhood was in direct conflict with her faith in God. But after a long discussion with Person, she would not only stick around, but she would become a part. Her participation in A Star is Born, both in front of and behind the camera, would make her one of the most well known artists, but it was Our Week of Peace 2016, that it became clear why Yavonne Squeaky Penn was here. All inclusive, we have always been, and that includes assuring that all faiths feel welcome. And while there are many essays and short stories with religious themes, nothing came close to defining our relationship with God until The Opening Prayer. Yavonne is not only in a gospel group – Anew(Duo) – but has a ministry of her own, where she often quotes specific scripture and is very conformable in spreading the word based upon her beliefs. But when she wrote the prayer for The Neighborhood’s Opening Day, she found a way to minister God’s love to all. Guy White is an amazing, old school animator, who relies on his skills as an artist more so than any app. He still produces cartoons the old fashioned way, drawing each frame which in some cases can take up to 300,000 drawings. But that is who he is. A commited artisan who shares that commitment within The Neighborhood. But it is not his talent, that makes Guy White so very special, but it is his spirit of ‘we are all in this together’, that make him the single biggest promoter of the neighborhood artists (and of so many others) without ever asking for anything in return. There are those who would take advantage of such a soul, but not here and not us. Because everyone will know…. for promoting every artists as if each one was not just a member of The Neighborhood, but one of your very own. 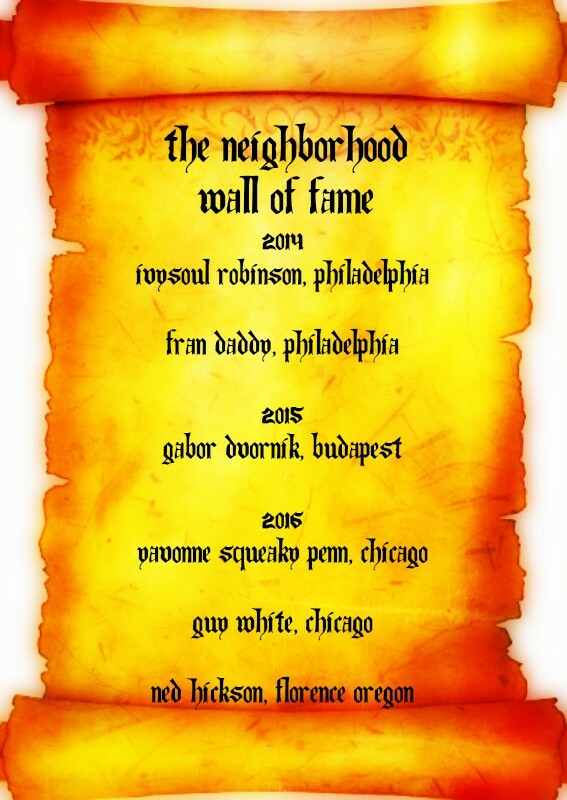 Guy White of Chicago, you are hereby given Our Highest Honor – 2016 The Neighborhood Award. Note from Jim Paul (aka Guy White): First I would like to thank Kendall Person for allowing me to participate in The Neighborhood shows. It’s always an honor and privilege to lend my creativity in some small way to any project. I would also like to say it’s been a pleasure to see and hear all of these creative personalities in one place. I can’t tell you how much I appreciate reading blogs, or listening to someone’s new song. Its gives me hope that there are still really creative Independent artist out there creating new and interesting work, and willing to share it with the rest of us. I would also like to thank Rebecca Lemke and IvySoul Robinson for asking me to collaborate on a project with them, it was fun and also completely different than anything I would have done and that’s what this is all about for me, you have three different people, from different locations, different points of views, different lives and at The Neighborhood we met, talked and created something, and this would have never happened if it’s wasn’t for Kendall Person and The Neighborhood. If The Story of Us – better known as The Neighborhood – ends today or a decade from now, there may never be another artist that has given so much of himself as our Ned Hickson. From The Comedy Show to A Star is Born and the Grand Champion of The Sexiest Number, Ned has displayed the type of character that makes us all so very proud and so much better. Selected as The Defining Moment in The Neighborhood’s All time Best Performances, there are simply no other words to convey other than thank you and we love you so very much. For elevating the online arts, for promoting collaboration within competition, and for being our biggest star, Ned Hickson, you are here by given Our Highest Honor – The Neighborhood Award 2016. Being a part of The Neighborhood — particularly A Star is Born and The Sexiest Number — has been one of the most rewarding, grueling and exciting experiences I’ve had a humorist and an artist. It showed me I was capable of doing more than I thought possible. And I wouldn’t have been able to do it without the inspiration and friendship of folks like Guy and Yavonne, and especially Rebecca Lemke, Robert Goldstein, Kendrick Merk Nichelson, Stephanie Lewis and most of all my amazing wife, Alicia. Thank you, Kendall, for pushing the limits and having the vision to create this incredible artists collaborative that is truly a one-of–a-kind place in the blogosphere.